Going Beyond the Trigger Point. Sometimes all it takes is the prick of a small needle to ease a painful, knotted muscle that has stubbornly resisted other forms of treatment. That’s one reason why a technique called trigger point dry needling is becoming more and more popular. Trigger Point Dry Needling involves inserting a needle directly into muscle tissue, zeroing in on the trigger points that can cause pain in your muscles, tendons or joints. Many Chiropractors have completed post-graduate education in and practice Acupuncture as adjunctive therapy to improve patient outcomes. As Chiropractors specializing in the musculoskeletal system, we are taught to address myofascial trigger points with deep pressure massage (trigger point therapy) to help break up those nasty little knots (trigger points) in our patient’s muscles. But, as an Acupuncturist, I have another tool in my therapy toolbox and I can needle the trigger points in the muscles and fascia to break up the trigger points and relieve localized and referred pain. When you get a taut band in your muscle it’s a sign that your muscle is not relaxing and contracting as it should. This can cause a painful knot, or trigger point to form: a sticking together or clumping of those tiny muscle fibers. Trigger points can be active and refer pain elsewhere or they can be inactive and just hurt locally. Traditionally deep massage and physiotherapy seemed like the only way to deal with these painful points, but I have found using a needle allows me to get directly into that trigger point to disrupt those taut fibers and help them to relax. Initially, the needling is going to cause a little bit of tissue damage, which is a good thing because it will cause more blood to flow to the area, which is very healing. I have used dry needling to treat neck pain, headaches, shoulder pain, back pain, tendonitis and conditions such as IT Band Syndrome, Piriformis Syndrome, Fibromyalgia and more. It has been a great tool to help patients reach the next level in their healing. A patient who has been utilizing massage and physiotherapy and getting good results – but not lasting results, are very good candidates for dry needling. It can really make a difference and help them reach the next level in their healing process. It’s not Acupuncture. Dry needling is different from acupuncture. 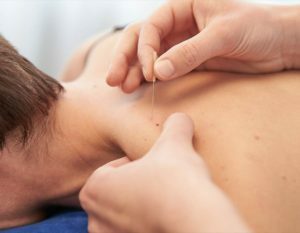 Acupuncture is a Chinese medicine technique based on the movement of qi (energy) and the flow of it in your body, while Dry Needling is focused on myofascial pain. while the insertion and use of the needle are very similar, but the philosophy and intent are very different. It may or may not hurt. Everybody’s threshold for pain is different. For some people, it feels like a tickle, others may find it to cause intense burning or pain, but that is only while the needle is being inserted and manipulated. Afterward,s most people will get muscle soreness like they worked out or were bruised, but then the soreness will clear up after a couple of days. There’s some research to back it up. A 2013 report in the Journal of Orthopedic and Sports Physical Therapy found that dry needling can reduce myofascial pain. The biochemical nature of it has been proven well, but there’s still a lot more research to be done. We need to go back to see how it works in very specific muscles. It may take more than one session. Depending on the severity of your muscle tightness, you may need repeated sessions (as with most therapies) to get lasting relief. It’s only one part of therapy. I (and most practitioners who use dry needling) do not use this treatment as a standalone therapy. Instead, it is used to augment chiropractic, massage and physiotherapy therapy. Because the goals of needling are not only to reduce or eliminate a trigger point but also to reduce pain and increase function, wouldn’t it make sense to take advantage of as much neuromuscular input as possible? If you’re ready to give Trigger Point Dry Needling a try, call Fort Myers Chiropractic Studio to schedule your appointment. Dr. Hoch (pronounced Hoke), is a 1988 Graduate of Peotone High School and a 1990 Graduate of Joliet Junior College. She Received both her B.S. in Human Biology (1991) and her Doctor of Chiropractic (D.C.) (1993) from The National College of Chiropractic in Lombard, IL. She also received her graduate and post-graduate certifications in Acupuncture from NCC. This article is copyrighted and may not be copied or duplicated in any manner including printed or electronic media, regardless of whether for a fee or gratis without the prior written permission of Dr. Hoch.